Join us at the Bull for our April Storytelling Meetup! This month's theme will be Creation! This theme is inspired by our cosponsor this month DreamQuilt, an applied arts and alternative entertainment production company here in Gainesville - learn more about DreamQuilt at the meetup! As always, our themes are open to your interpretation. We need your story submissions by Monday, April 15th! This meetup will be held on Thursday, April 18th from 7:30-8:30 PM at The Bull! This month's theme will be Risks! This theme was from the suggestion box, thanks to the attendee who suggested it. As always, our themes are open to your interpretation. We need your story submissions by Monday, March 18th! This meetup will be held on Thursday, March 21st from 7:30-8:30 PM at The Bull! Join us at the Bull for our second Storytelling Meetup of 2019! This month's theme will be Starts! This theme is inspired by startupGNV - a non-profit advocating for and elevating Gainesville’s start-up community and as always, our themes are open to your interpretation. We need your story submissions by Monday, February 25th! This meetup will be held on Thursday, February 28th from 7:30-8:30 PM at The Bull! Story Summit is Gainesville’s best night of storytelling. You’ll hear some of the best storytellers from Self Narrate Guts & Glory GNV, and The Conch-Gainesville's True-storytelling Project at the intimate Heartwood Soundstage. Join us at the Bull for our first Storytelling Meetup of 2019! This month's theme will be Dreams! This theme was from the suggestion box, thanks to the attendee who suggested it. As always, our themes are open to your interpretation. We need your story submissions by Monday, January 21st! This meetup will be held on Thursday, January 24th from 7:30-8:30 PM at The Bull! "Voices of Gainesville: Facing the Facts, Sharing the Stories" will be at the Hipp Cinema on Monday, September 10, October 1, and November 5 at 7:30 p.m. The “Understanding Racial Disparities in Alachua County” report detailed disparities in employment, criminal justice, education, housing and poverty in Gainesville. How do we as a community address this? Storytelling is a powerful art form creating connections and understanding. SelfNarrate is hosting a storytelling series to give a face and a voice to the statistics of those most affected by these disparities. Community leaders will also tell their personal stories, and of the challenges faced in addressing systemic racism. Through these stories we can build bridges and begin to work together. Doors at 6:30 p.m., starts at 7 p.m.
Our October storytelling meetup is a bit different than usual as we will be celebrating the release of Braided Brook Volume 3! Braided Brook is Self Narrate's annual literary journal of personal stories. Learn more about it at www.braidedbrook.com. We will have a VERY limited number of copies of Braided Brook Volume 3 available for purchase at this event for $10 each. This reading & meetup will be at The Bull on October 18th, from 7:30-8:30PM. 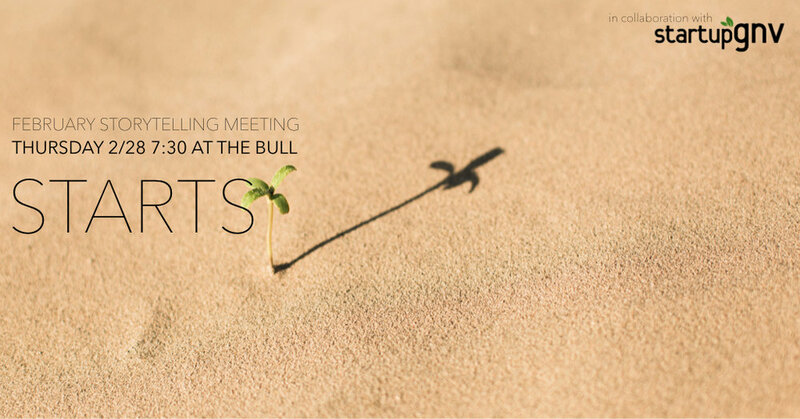 Join us at the Bull for our September Storytelling Meetup! This month's theme will be Coming of Age! This theme was from the suggestion box, thanks to the attendee who suggested it! As always,our themes are open to your interpretation. We need your story submissions by Monday, September 24th! This meetup will be held on Thursday, September 27th from 7:30-8:30 PM at The Bull! Doors at 7 p.m., starts at 7:30 p.m.
We're often asked when the next time our Personal Story Development Workshop would be offered to the public, well... We're excited to announce our first open-to-the-public workshop in nearly a year! Come learn how to write your story with Self Narrate on May 26 from 1-3PM. Join us at the Bull for our April Storytelling Meetup! This month's theme will be "Nobody Understood." As always,our themes are open to your interpretation. We need your story submissions by Monday, April 16th! This meetup will be held on Thursday, April 19th from 7:30-8:30 PM at The Bull. Our February meetup is about Connection! As always,our themes are open to your interpretation. We need your story submissions by Monday, February 12th! This meetup will be held on Thursday, February 15th from 7:30-8:30 PM at Third House Books! Story Summit is Gainesville’s best night of storytelling - You’ll hear some of the best storytellers from Self Narrate, Guts & Glory GNV, and The Conch at the intimate Heartwood Soundstage. Over the past five years, Gainesville’s storytelling community has transformed from a relatively obscure art form to a widely recognized community, with multiple opportunities to hear and share great stories every month. There are a few organizations fostering this growing storytelling community, and on January 18, three of them are coming together for the first time at Heartwood Soundstage to showcase some of their best storytellers at Story Summit. At Story Summit, you’ll hear some of the best storytelling that Gainesville has to offer, curated by the organizers of Self Narrate, Guts & Glory GNV, and The Conch. Join us at Turlington Plaza on UF campus for a special storytelling activity! Click here to learn more about the My Story Is... project!